I’ve been posting little things about the Pacers lately, so I’ll try not to go overboard with them. I can’t resist talking about Lance Stephenson though. Lance Stephenson’s progression, along with a couple other Pacers in their starting lineup, is one of the main reasons I’ve enjoyed watching Indiana this year. Their starting shooting guard has gone from rarely playing two seasons ago to a key, important cog. It’s a nice story by itself, considering how great the odds were against him carving out a solid career in the NBA when he was drafted 40th overall in 2010. 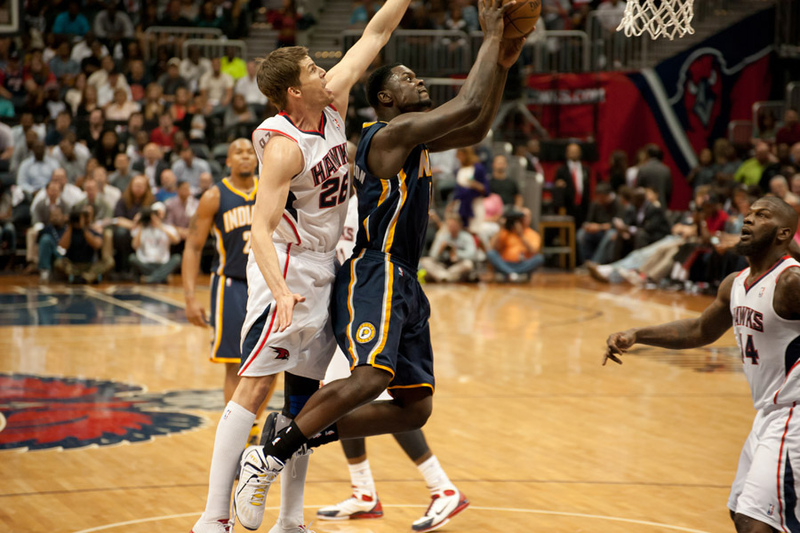 The all-around numbers are there for Stephenson: 12 points, 6.7 rebounds, 5.1 assists, all nice upticks from last year. He’s also had more time with the ball in his hands, 2.6 minutes compared to 1.5 last season, the latter stat according to a piece on him from Grantland. It made me draw a comparison to a higher-paid shooting guard. Lance Stephenson is Bizarro Tyreke Evans. But even with the improved stats, Stephenson is still as unpredictable as last season, in my couch potato opinion. Granted, I don’t watch every Pacers game just like I don’t catch every game from every team minus the Minnesota Timberwolves, but I never know what to expect from the Indiana’s starting shooting guard whenever I happen to be watching them. Stephenson’s unpredictability still leaves two sides of him: Good Lance and Bad Lance. Both are entertaining because neither seems all that conventional. Given how badly he misses some of his shots, I assume he shoots with his eyes closed and more than a few plays he’s made have led to “noooo…YES!” moments like what I wrote about Corey Brewer recently. And ever since Stephenson brushed off his teammates multiple times in the Eastern Conference Finals to take LeBron James one-on-one, I assumed he didn’t have ice in veins but mustard instead. It’s like he was in the film 300, waving off the Spartans so he could take on the Persians himself. That confidence might not have worked out well nearly six months ago but, like Paul George and Roy Hibbert, you could sense Stephenson was going to make a bang the following season. And he seemed like an early candidate for Most Improved Player of the Year through the first eight games, averaging about 14 points, six rebounds, and six assists. His turnover rate was only slightly up from 2013, which was even more of a positive when his usage rate went from 15.2 to 19.5 and the total number of assists he accounted for while on the floor nearly doubled, according to Basketball-Reference. He even had a triple double against Memphis with 13 points, 12 rebounds, and 11 assists while turning it over just once. Stephenson’s progression seemed very encouraging, except for the fact it raised his value six months from now. But the shooting splits through the first eight games remained bizarre in typical Stephenson fashion: 47.9 percent from the field, 51.4 from three and…42.9 percent from the line. That doesn’t exactly add up. And then came Bad Lance, who’s just as entertaining as Good Lance but nowhere near as efficient. In the next 10 games, Stephenson shot 10.5 percent from three on nearly two attempts per outing, creating one of most hot-cold shot charts in the process. His offensive rating went from 111 through the first eight games to 93 over the last 10, but he made 72 percent of his free throws and recorded yet another triple-double. But the turnovers and assists went up and down, respectively, with the turnover rate in the last 10 games up to 24.3 percent and the assist rate at about 20, according to Basketball-Reference. If those rates happened all season they would put Stephenson in similar company as awkward wings like Gerald Wallace and guards like D.J. Augustin. But that hasn’t been the case all season and at 16-2, Indiana has been fine regardless of whether Good Lance or Bad Lance shows up, the frequency of each nearly split in half. Sooner or later, though, the Pacers will need the more efficient version on a consistent basis. ← Could Roy Hibbert really block more shots than an entire team?